Are Daily Bowel Movements Normal? It is a myth that everyone should have a daily bowel movement. The results of studies show that some people have one as often as 3 times per day while others go just 3 times per week. Both of these is entirely normal. Constipation is defined as having less than 3 bowel movements per week. People who have severe constipation go less than once per week. It is a myth that people who are constipated are full of toxins. There is no evidence that stool is full of toxins. There is no evidence that fads and treatments like laxatives, colon cleansing, and enemas prevent diseases and cancer. If you happen to be constipated or have fewer bowel movements than others, that does not mean that you are absorbing poisonous substances from stool. It is not true that fiber fixes all cases of constipation. Although it is true that most people do not get enough fiber in their daily diets, extra fiber may make some types of constipation, like slow-transit constipation, worse. Slow-transit constipation refers to slow passage of stool through the large intestine due to reduced motility. Good sources of dietary fiber include whole grains, fruits, vegetables, and other plant foods. Try adding these fiber-rich foods to your diet. They will help bulk up stools and should help many cases of constipation. If they do not, see your doctor. Can Gum Get Stuck in Your Stomach? It is a myth that if you swallow gum it will stay in your stomach for 7 years. Gum is made of sugar or artificial sweetener, preservatives, flavorings, and gum resin. Your digestive tract will absorb the sugar if you swallow gum, but the remaining gum resin will pass through and out of the body. A blockage may result if someone swallows a large quantity of gum or swallows gum along with things that are indigestible, such as coins or sunflower seeds. Very young children may be at greatest risk for swallowing gum because they may not understand that it should be chewed, not swallowed. 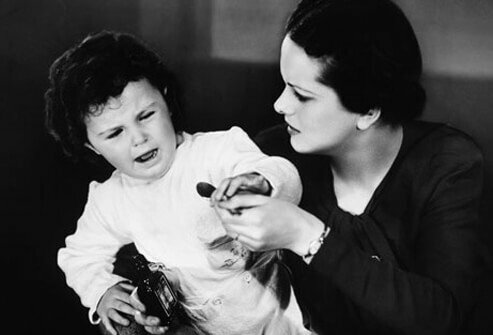 As a general rule, do not offer gum to children under the age of 5. It is true that lifestyle changes and changes to your daily routine can trigger constipation. Changes to your diet, sleep time, and adjusting to new time zones may all lead to constipation. While traveling, especially flying, drink lots of water. Stick to bottled water if the tap water at your destination is not safe to drink. Try to stay active as well. Stretch your legs, get up and move, and walk around the airport while you are waiting for your flight. Eat lots of fruits and vegetables. Stick to cooked produce if is unsafe to eat raw fruits and veggies at your destination. It is true that depression and mood disorders may trigger constipation or make it worse. Take measures to reduce stress in your life to keep your bowels moving regularly. Yoga, meditation, biofeedback, and relaxation training techniques are proven ways to combat stress. Acupressure and shiatsu massage may work, too. Another trick you can try is massaging your abdomen. Massaging your abdomen in a circular, clockwise fashion may help keep things moving. Many people appreciate that these interventions are all-natural. This is not a myth. It is true that holding in a bowel movement may not only be uncomfortable, but it can actually trigger or worsen constipation. When you feel an urge to have a bowel movement and heed the call, the normal nerve reflex that helps you pass stool is reinforced. If you repeatedly ignore the urge to have a bowel movement when you need to, it may lead to constipation. If you have a busy schedule, make sure to allow for time for bathroom breaks after breakfast or another meal throughout the day. That is when the urge to have a bowel movement is the strongest. It is true that medications prescribed for conditions like high blood pressure, Parkinson's disease, depression, acid reflux, seizures, and pain may trigger or exacerbate constipation. 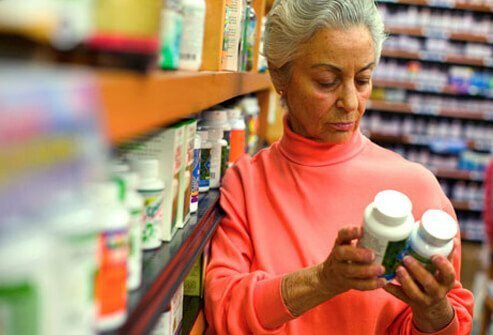 Iron supplements and calcium supplements may also have an effect on your bowel function. Do not stop taking a medication or change the dose of a medication without consulting with your doctor. If you believe one or more of your medications is causing constipation problems, talk to your doctor. He or she may adjust the dose or switch you to a new medication that does not cause constipation side effects. It is not true that all fiber is the same. There are different types of fiber that do different things in your body. There are two kinds of fiber in food. Insoluble fiber and soluble fiber. 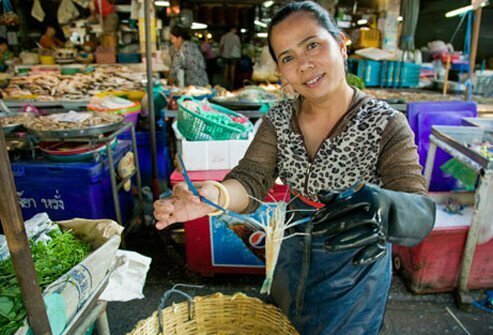 It is also the bulk-forming fiber that helps stools pass more quickly through the intestines. 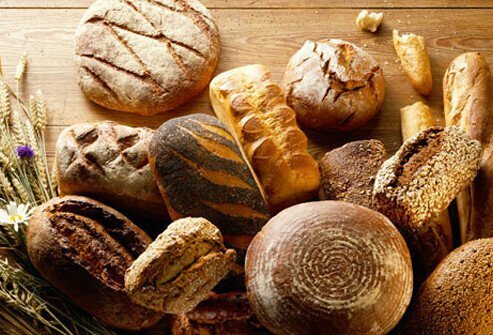 Whole-grain breads, cereal, and pasta are good sources of insoluble fiber. Soluble fiber holds water and is found in beans, peas, and oats. Both types of fiber also help reduce the risk of cardiovascular disease. Does a glass of prune juice help relieve constipation? This is true. Prunes are dried plums. They are a rich source of insoluble fiber and sorbitol, which serves as a natural laxative. 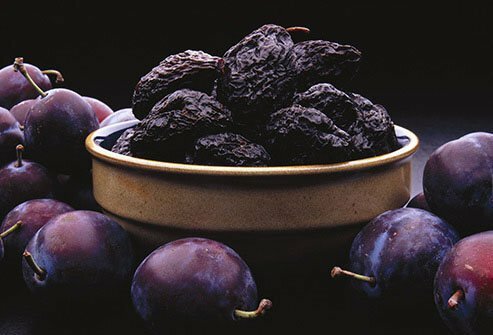 If you do not like the taste of prunes, try drinking a glass of prune juice or mix prune juice with other fruit juices to mask the taste. Other fruits that may help relieve constipation include pears, grapes, and apples. Diets high in fruits and vegetables provide fiber that helps prevent or alleviate constipation. 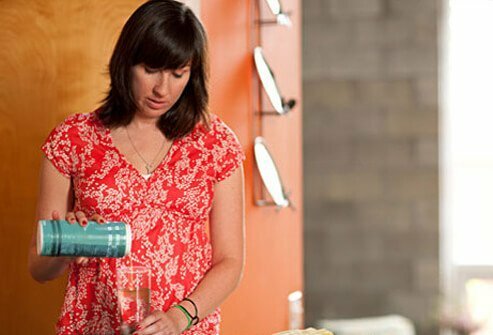 Making sure you are adequately hydrated will make stools softer and easier to pass. This eases constipation. Increase your fluid intake by sipping beverages like water and fruit juice. Make sure to avoid beverages that dehydrate you like caffeinated coffee and alcohol. Fruits and vegetables also supply some water. How do you know if you are drinking enough water? Your urine should be a pale-yellow color. Darker urine is a sign of dehydration. If your urine is colorless, you may be drinking too much water. It is true that exercise will help keep your bowels moving. Being sedentary is a risk factor for constipation. If you do not have a lot of time to work out, even taking several 10- to 15- minute walks a few times a day will help. If you are able to do longer workouts, that is great, too. Exercise is good for your whole body and mind. Just make sure to wait at least 1 hour after eating before you work out. Give yourself a chance to digest before being active. This one is not true. 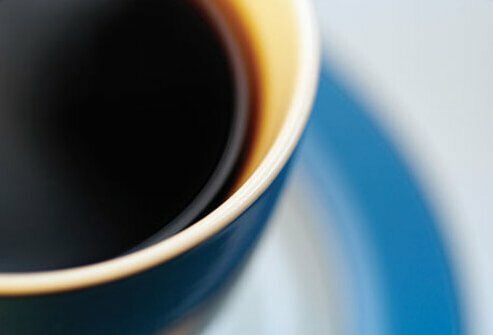 While caffeine can stimulate muscles in the digestive system, facilitating a bowel movement, caffeine is also dehydrating. It is best to avoid caffeinated beverages if you suffer from chronic constipation. If you cannot give up coffee altogether, opt for decaf instead. How do you know if you are dehydrated? Symptoms of dehydration include light-headedness, dizziness, nausea, headache, and fatigue. Monitor the color of your urine throughout the day to check your hydration status. Dark yellow may mean you need more fluids. It is a myth that enemas and colonics can help prevent or cure constipation. The exact opposite may be true. 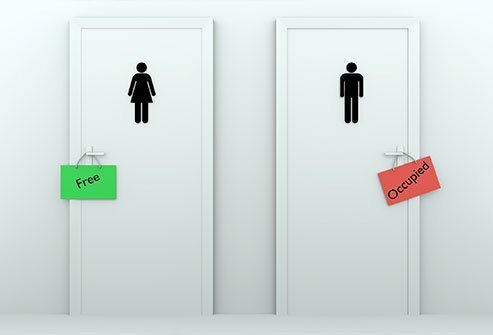 Doctors may prescribe an occasional enema to help you have a bowel movement if other interventions have not worked, but chronic use of these aids may actually increase constipation in older people who do them regularly. 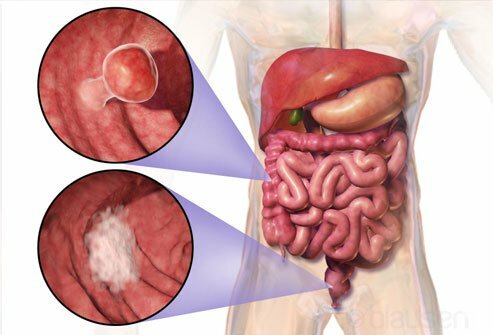 Colonics can damage the colon. 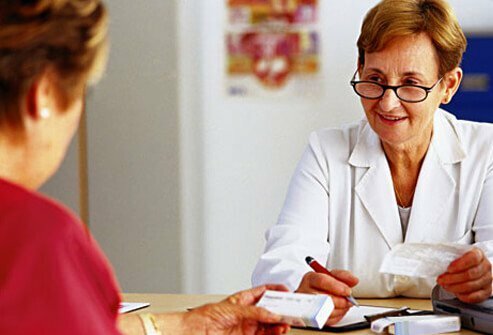 Do not use over-the-counter stimulant laxatives or stool softeners without consulting with your doctor first. Long-term use of these medications may lead to increased problems with constipation. This one is not true either. 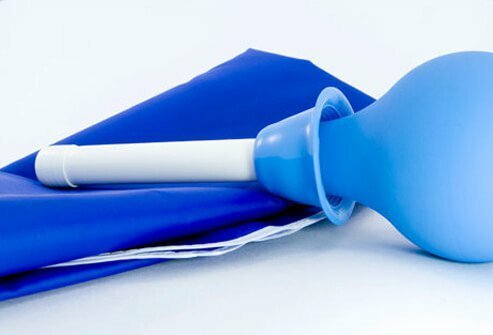 Some types of enemas or suppositories may work within an hour, but laxatives that add bulk to stools, like FiberCon or Citrucel may take several days to work. Stimulant laxatives may work within just a few hours. They should not be used long-term because they can make constipation worse. Most cases of constipation last only a few days. Talk to your doctor if you use laxatives for more than 2 weeks. Stool softeners are laxatives that work by promoting the absorption of more water from the colon. It is hard to pass stools when they are hard. Softer stools are easier to pass. Another name for a stool softener is an emollient laxative. They are gentler than other types of laxatives and they are generally less effective. Stool softeners work best for those who have temporary bouts of constipation or those who have milder forms of chronic constipation. Like all laxatives, stool softeners should only be used for short periods of time. Be careful with this one. Castor oil is a potent laxative and it is an old home remedy for constipation, but it can be associated with side effects. Ask your doctor before using castor oil to treat constipation. It may interfere with the activity of medications you take for other medical conditions and it may inhibit in the absorption of certain nutrients. Habitual use of castor oil may damage the nerves, tissues, and bowel muscles in your gastrointestinal tract, which may lead to more problems with constipation. Some people use mineral oil to ease constipation. This is not recommended. It can deplete your body of fat-soluble vitamins like A, D, E, and K.
This is false. While it is true that many older people are more likely to experience constipation, it is not due to aging. 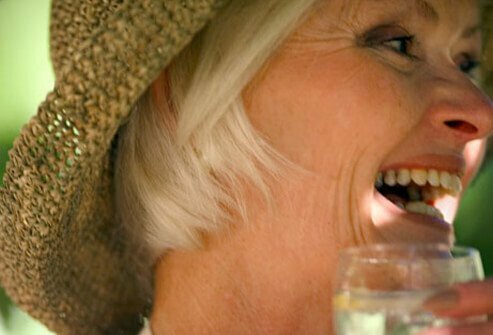 Older adults may eat low-fiber diets, be physically sedentary, and take certain medications that make constipation more likely. Constipation can happen to anyone at any age. It is a very common medical problem. It usually is not a cause for concern. Most of the time, constipation is not serious. Contact your doctor if constipation does not go away after trying proven home remedies like drinking more water, increasing your fiber intake, and getting more exercise. All of these interventions should help your intestines and bowel function better. This one is also false. Although you may occasionally have some blood in your stool, you should contact your doctor right away if you notice this. Blood in stool may not always be serious, but you still need to be checked out. Sometimes, constipation and straining may cause bleeding. Pay attention to the color of stool. If it is tarry black, maroon, or if you notice blood clots, it is likely that you have bleeding from somewhere higher up in your digestive system. There are many potential causes of blood in the stool ranging from milder sources like hemorrhoids to more serious conditions like peptic ulcers and cancer. It is true that flax seeds are a proven, natural remedy for constipation. Flax seeds are rich in soluble and insoluble fiber. One tablespoon of whole flax seeds contains 2.8 grams of fiber. 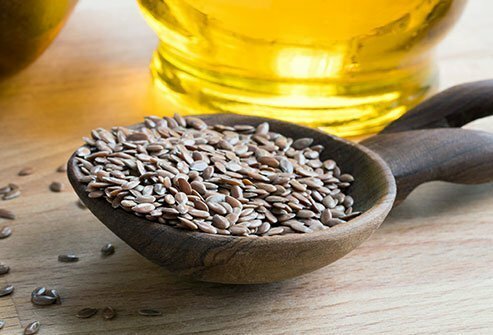 Flax seeds are also rich in an anti-inflammatory omega-3 fatty acid called alpha-linolenic acid. These beneficial fats may help reduce the risk of inflammatory bowel disease (IBD), heart disease, arthritis, and other medical conditions. Add ground flax seeds to your morning smoothie or sprinkle them over yogurt to reap the health benefits. Probiotics are beneficial bacteria that improve gut health, improve digestion, and affect immune function. There is some evidence that probiotics may improve constipation. Probiotics decrease the amount of time that stool takes to move through the bowel. They also improve the consistency of stool and lead to more frequent bowel movements. Studies suggest the probiotic species, Bifidobacterium lactis, are very beneficial for bowel health. Some strains of Bifidobacterium may be helpful for those who have abdominal pain and bloating due to irritable bowel syndrome, too. 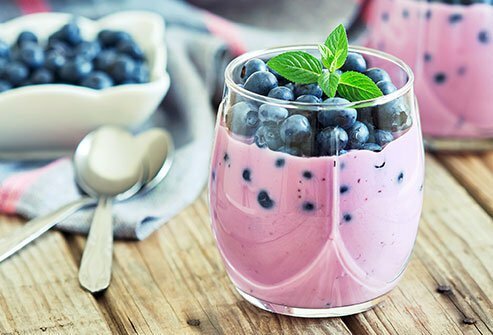 Eat yogurt with live active cultures, kefir, or kombucha to get your fill of beneficial bugs to help your belly. This is false. There is no evidence that constipation increases the risk of colon cancer. Prior studies suggested a link between the two, supposedly because prolonged contact of stool with the bowel was thought to expose the body to carcinogenic substances in stool. A newer study has found that this just is not true. However, you should still see your doctor or gastroenterologist if you frequently suffer from abdominal pain, bloating, gas, chronic constipation, or other symptoms of gastrointestinal distress. This is true for some women. One study found that approximately 15 percent of women become constipated before their period. About 10 percent of women are constipated during their period. Changing levels of hormones are believed to be responsible for the effect. If you are prone to constipation before or during your period, drink more water, increase your intake of nutrient-dense fruits and vegetables, and add extra activity to your routine. 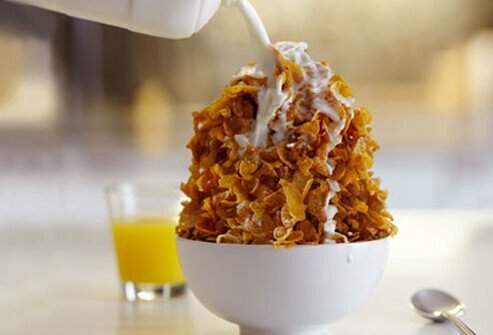 Ask your doctor if it is a good idea to add a bulk-forming laxative to your diet. ACSMs Health & Fitness Journal: "The Hydration Equation: Update on Water Balance and Cognitive Performance." American Academy of Family Physicians: "Laxatives: OTC Products for Constipation." American Heart Association: "Whole Grains and Fiber." American Journal of Clinical Nutrition: "The Effect of Probiotics on Functional Constipation in Adults: A Systematic Review and Meta-Analysis of Randomized Controlled Trials." The American Journal of Gastroenterology: "Association between Constipation and Colorectal Cancer: Systematic Review and Meta-Analysis of Observational Studies." 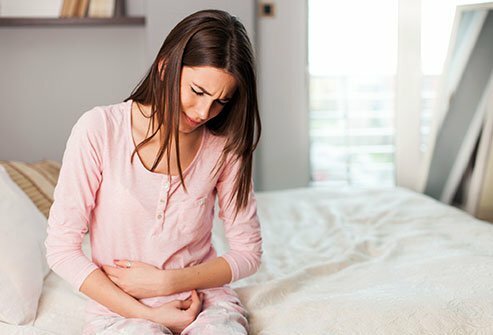 BMC Women's Health: "Gastrointestinal Symptoms Before and During Menses in Healthy Women." Cleveland Clinic Journal of Medicine: "Update on Constipation: One Treatment Does Not Fit All." Gastroenterology & Hepatology: "Probiotic Therapy for Irritable Bowel Syndrome." Gut: "Patients with Functional Constipation Do Not Have Increased Prevalence of Colorectal Cancer Precursors." Harvard Health Publications: "Constipation and Impaction." 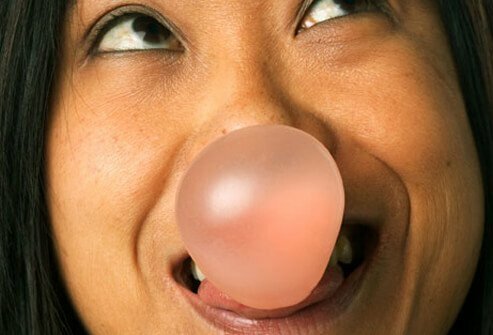 KidsHealth.org: "What Happens to Swallowed Gum?" National Institute of Diabetes and Digestive and Kidney Diseases: "Symptoms & Causes of Constipation," "Symptoms & Causes of GI Bleeding." NIH National Center for Complementary and Integrative Health: "Stress." 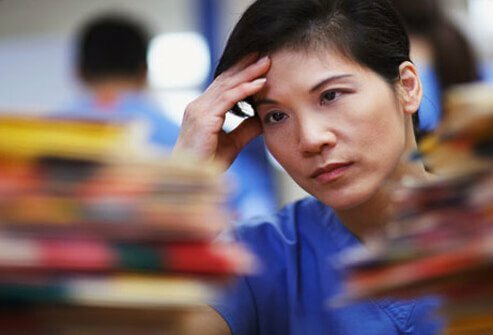 Nursing Times: "Does Abdominal Massage Relieve Constipation?" Pediatric, Gastroenterology, Hepatology & Nutrition: "Diets for Constipation." Scandinavian Journal of Gastroenterology: "Assessment of normal bowel habits in the general adult population: the Popcol study." UpToDate: "Constipation in Adults: Beyond the Basics." USDA: "The Benefits of Flaxseed." USDA National Nutrient Database for Standard Reference: "Seeds, Flaxseed."